Ever since Zane Grey visited New Zealand in the 1920's and wrote of his fishing adventures in "Tales Of an Angler's El Dorado" Taupo has been recognised as one of the worlds great trout fishing destinations. The region has since been written of many times and hosted famous visitors from around the world who come in pursuit of arguably the finest of fighting sport fish. Casting out in the Waitahanui Stream, just one of Taupo's famous fishing streams. Two types of trout, Brown and Rainbow, populate the Taupo fishery and were introduced to Taupo in the late 19th century. 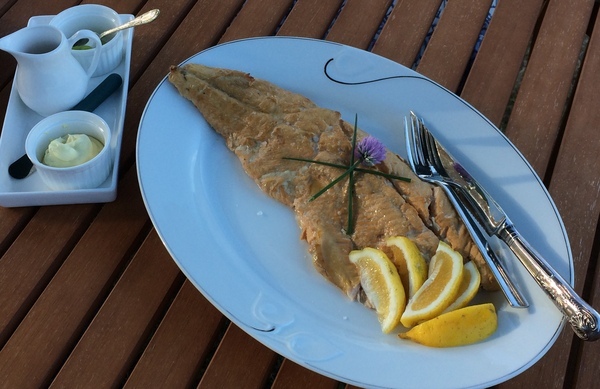 Rainbow Trout were introduced from California and Brown trout came from Scotland via Tasmania. In the early 20th century a 23kg (50lb) trout was speared in Kuratau and average trout were about 8lb. These days this has reduced to a still very healthy 4lb. It is thought that this is due reduced numbers of native fish and koura, a native crayfish, that occured early after the introduction of the species. The Taupo fishery is now a wild fishery with stock and feed self regulating. Trout numbers are monitored annually at spawning and are robust. Brown Trout slightly outlive Rainbows, typically surviving 8 years although there are records of fish surviving 15 years. Trout cannot be bought or sold in New Zealand and so the only way to experience this fine fish is to go catch your own or be given it as a gift. This is one of the methods used to ensure conservation of the fishery. The minimum size for trout in the Taupo catchment, which includes all of the rivers and streams flowing into the lake, is 40cm. To go fishing a license needs to be purchased which can be easily done online, by us, or arranged by your guide or local tackle shop and is relatively inexpesive. In most of the rivers of the catchment only fly fishing is allowed. Trolling and jigging are allowed in the lake using only artificial lures. 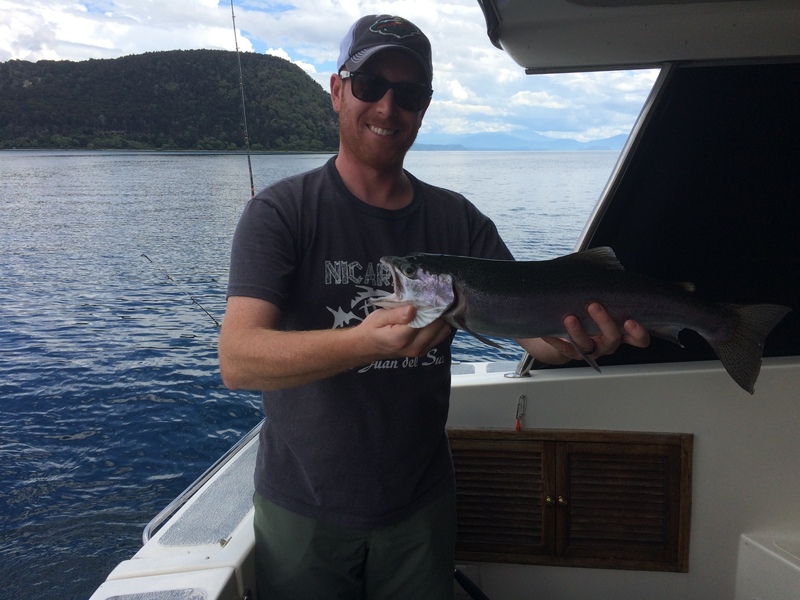 For a summary of the Taupo Fishery Regulations click here. A beautiful 5lb lake Rainbow Trout in perfect condition. This one measured 60cm and is about 2 years old. At Whakaipo Lodge, to ensure the best possible experience, we work with a select group of guides and charter boat operators who are knowledgable, but also able to share and understand the needs of our visitors. We recommend a minimum of a half day on the river or lake. The art of fishing requires patience, especially if you are fly fishing, when a longer spell on the river will be rewarding. Fly fishing is the true fisherman's choice where stalking, casting and landing the fish requires no small amount of skill and effort. It can be a superb way to experience some of New Zealand's pristine wilderness areas. Fishermen are generally dressed in waders to keep dry and warm as they are wading in the river or lake while fishing. Local guides are able to assist in teaching techniques, including where to fish and what flies to use. Waders, rods, lures and boots can be easily purchased at one of the many fine tackle shops in Taupo or Turangi and if you are going guided hire of this equipment is included in the price. If catching a fish is your top priority the best way is to go onto the lake in a boat, where trolling is the preferred method. Fishing from the boat is relatively sedentary with comforts including food and beverage if you desire. Again, all the equipment is provided on the boat. Like all activities in the natural environment there are no guarantees, although our charter boat guests rarely return empty handed! If you are lucky enough to land a trout, we are happy to prepare and cook it for you at Whakaipo Lodge. 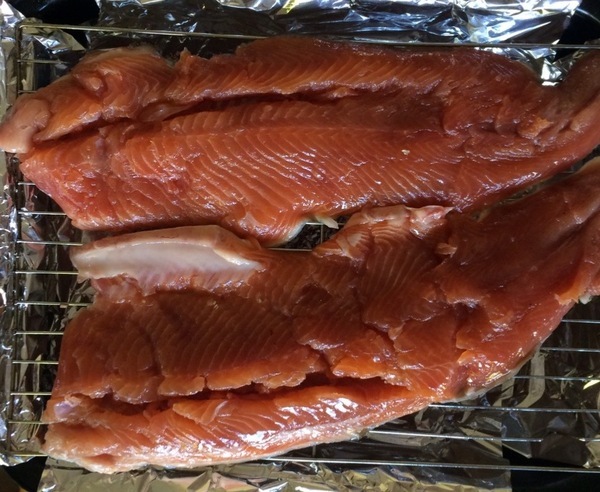 We have several methods that we use but one of our favourites, a lodge secret, is to hot smoke fillets using Scotch Whiskey and Manuka chips to impart a flavour that is spectacularly and uniquely New Zealand. This method takes a few hours to do justice and so we generally prepare and cook fish caught earlier in the day or the previous day. Taupo also is blessed with a number of commercial smoke houses that are able to prepare and pack trout for export if you wish to take your fish with you. Rainbow fillets on show here exhibiting a beautiful natural pink colour prior to going into the smoker. There is nothing quite like the satisfaction of spinning a yarn about your day, while sharing good company and enjoying a fine New Zealand white wine, with your Lake Taupo trout, in the garden, or in front of the log fire at Whakaipo Lodge. After all, wasn't the saying "never let the truth get in the way of a good story" created for the fisherman! The finished fish served with Whakaipo Lodge's fresh baked whole meal bread (not shown), some wasabi cream fraiche and soy or lemon. 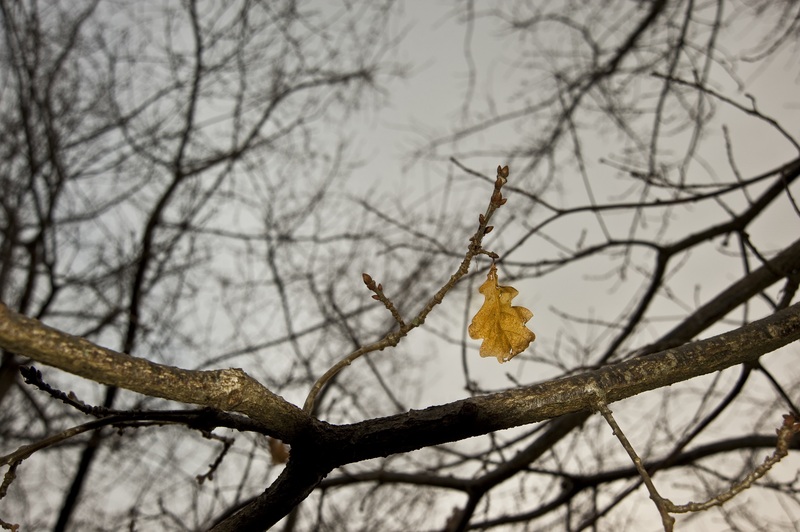 The trees have lost their summer greenery and turned past gold and red to lay bare their lichen clad branches and become remnants of another season gone by. Green grass has given way to sphagnum moss and the garden has given up its colour - well mostly - and rests. Its a time for some of the mundane jobs. Dead heading and pruning of perennials and roses ready for spring along with looking after our stock to help them through the cold of winter. 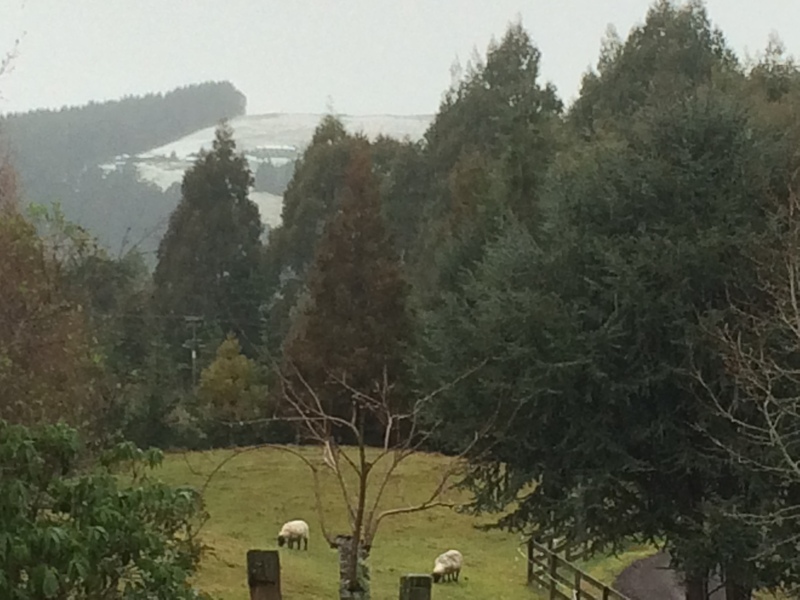 The sheep actually love it, with their built in woolly coats designed by nature to deal with the rain and cold of the hill country. Cold rainy days can provide a respite from the hard work of play. Nothing more relaxing than time in front of the log fire with hot tea, coffee, or something stronger to cheer the heart. While a good book can keep one company there are the games that family groups can play. Cards and board games, all part of an experience creating happy memories to last a lifetime. Then the weather breaks and there a just too many options. 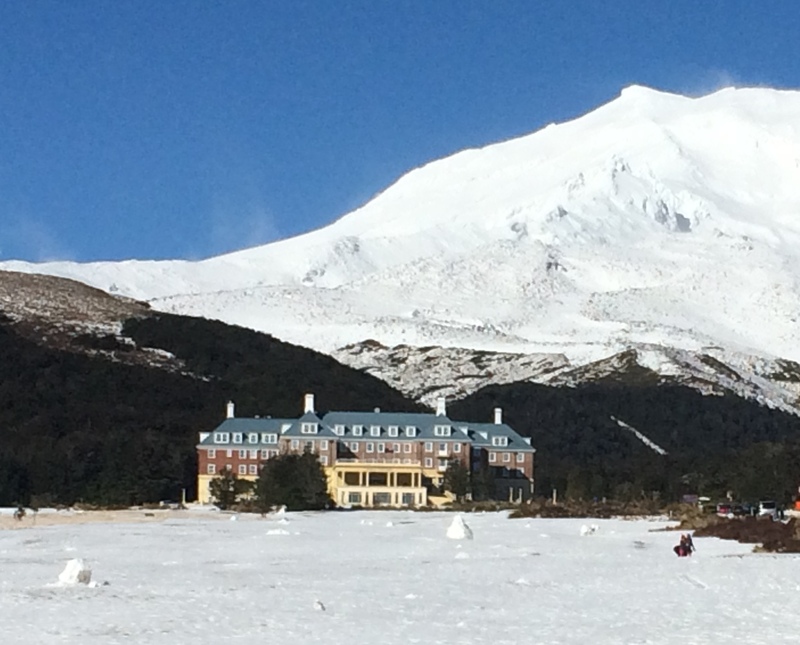 Visiting our Tongariro National Park for a walk or skiing, biking our fantastic wilderness trails for real adventure, or just cruising the town trails and visiting a gallery, cafe or two on the journey. The mountain biking in Taupo provides year round fun with pumice trails delivering good riding conditions in all but the very worst weather. Why not finish off with some of the fantastic local food that we serve at Whakaipo Lodge? We really do endeavour to showcase the "best of New Zealand" with favourites such as local leg of lamb, butterflied naturally and treated with local herbs. Then there is salmon or eye fillet beef, all accompanied by lodge grown vegetables and carefully selected local produce. There may even be some trout served as part of our complimentary canapes. You cannot buy trout in New Zealand. it is strictly a game fish and can only be gifted or you may have even been lucky enough to catch your own with one of the world class guides that work for Whakaipo Lodge! 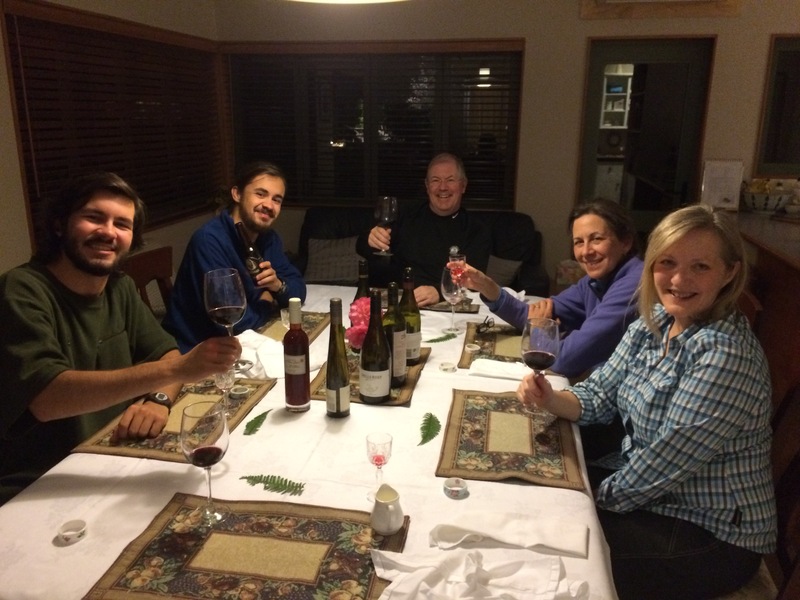 Then, of course, don't forget the fine New Zealand wine and the great Kiwi hospitality of your hosts Garth and Angie. You may even get to sample Whakaipo Lodge Damson Gin while you finish with some of Angie's hand-made chocolates truffles. Yum! An experiencee we hope that you'll take with you forever! Since our last blog we've enjoyed a busy Summer and Autumn season and its nearly over so, there’s time to tap the keyboard again. 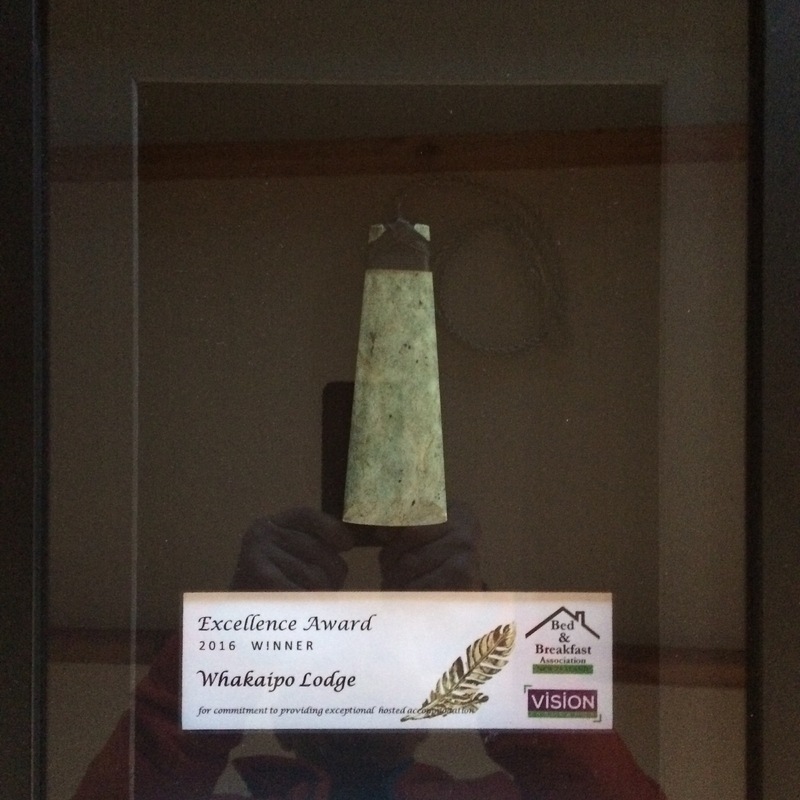 Firstly, we are pleased to be able to tell everyone that we have just returned from the Bed & Breakfast Association New Zealand 2016 Conference where Whakaipo Lodge has picked up the Supreme Excellence Award. This Award recognises excellence across a range of areas including guest experience, marketing and business management, environmental and sustainability, industry and community engagement. With a relatively short involvement in the industry we were surprised and delighted to win this Award. 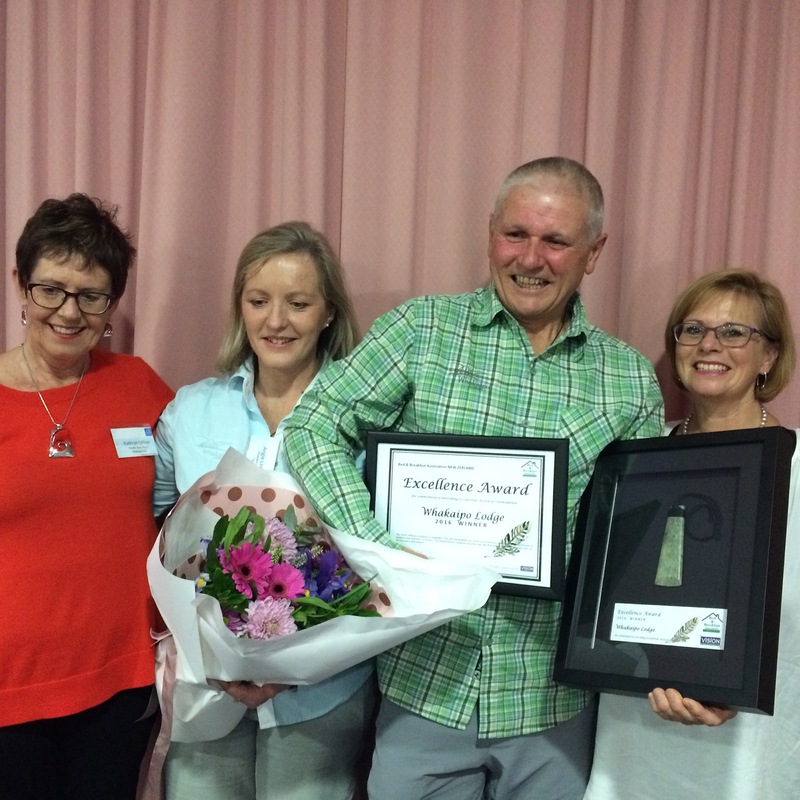 Angie & Garth London with B&B Association NZ President, Kathryn Officer & Secretary Fiona Rollings with the award, Te Toki Pounamu, a greenstone adze. 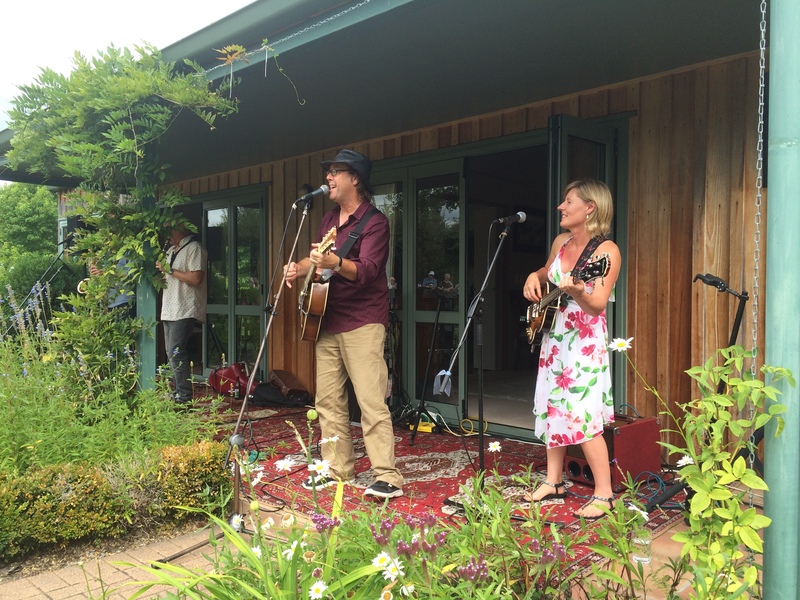 Our Summer concert , supporting Bike Taupo, and featuring Andrew London and his band was a success. Despite the cyclone forecast the weather behaved and a great time was had by everyone. Andrew played new material from his album "Let's Have Friends Around For Dinner",as well as old favourites such as "Emily Bay". We are pleased to be able to announce that the 2017 Whakaipo Lodge Summer Concert will be featuring a diverse line-up with Laura Collins’ Back Porch Blues Band, Wayne Mason and Andrew London all performing. These guys collectively, and individually, are legends of the NZ music industry so get Saturday 25 February 2017 into your diaries. This one will be a cracker! Andrew and Kirsten belting out another number at the Whakaipo Lodge Summer Concert. Supporting Bike Taupo. The Summer season has been huge with fishing, biking and hiking, relaxation, food and wine, all proving to be big drawcards for visitors to the Lake Taupo region. With our long Summer and very mild Autumn we were still swimming in the lake into May and no wetsuits were required! Guests taking the opportunity to fish the lake on Bravado 3 were rewarded with good catch numbers and some nice trout to take back to Whakaipo Lodge. Naturally we were only too pleased to be able to smoke and serve these with some fine local wines. 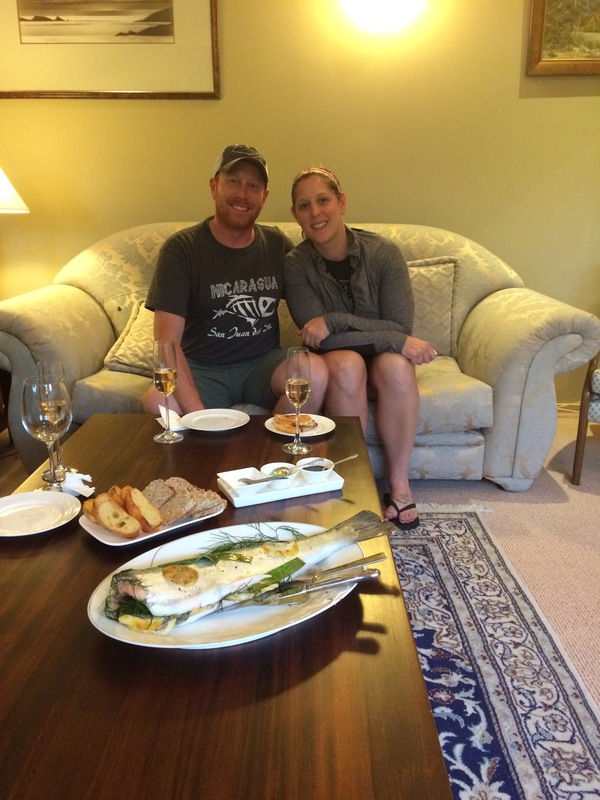 Blair & Amber from Minneapolis took 3 of the 14 trout landed from Bravado 3 with one baked for their enjoyment. With the opening of The Great Lake Trail last year Taupo was finally able to boast a trail worthy of Nga Haerenga, The New Zealand Cycle Trail, and showcase New Zealand's largest lake, Lake Taupo. The trail, which is just over 70 km in length, is one of many to underpin Taupo's, and the Central North Island's, status as the premier mountain biking centre in New Zealand. Riding areas abound. Rotorua's Redwoods bike park and Lake Taupo's Craters Bike Park are great places to start before moving onto cross country trails. 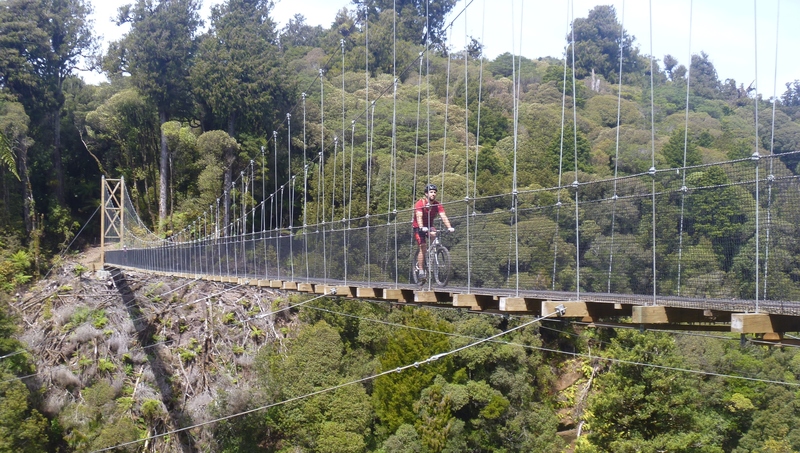 Wilderness multi-day rides such as The Timber Trail, The Great Lake Trail and Mountains to Sea, including the Bridge to Nowhere, are fast becoming icons in New Zealand mountain biking lexicon. Their reputation is fast spreading to Australia and much further afield. Nearer to the townships are shorter rides such as Huka Falls, Aratiatia and the Tongariro River Trail, worthy for their spectacular scenery as well as being a lot of fun. Lake Taupo is the perfect place to base yourself as it is central with most rides within a one hour drive of this bustling and vibrant lake-front township. Taupo is well supported with restaurants, bars and of course thermal pools to relax in and soak away your aches while contemplating the next day's excitement. Rides are generally on pumice, which is free draining, so even if you're unlucky enough to catch some rain most trails remain in great condition. The Timber Trail and The Great Lake Trail are usually ridden over multiple days with vehicle and boat shuttles required to get to some of the wild places that access the trails. Most rides require a reasonable level of fitness and some mountain biking experience. However there are rides that novices can undertake including Lake Taupo's lakefront Lion's Ride, an excellent flat ride that can be punctuated with a coffee and swim in Lake Taupo in summer and the Tongariro River Trail, which explores some of the best trout fishing locations on this world-renowned fishing river. Some sections of the Great Lake Trail are also suitable for fitter, more confident beginners. 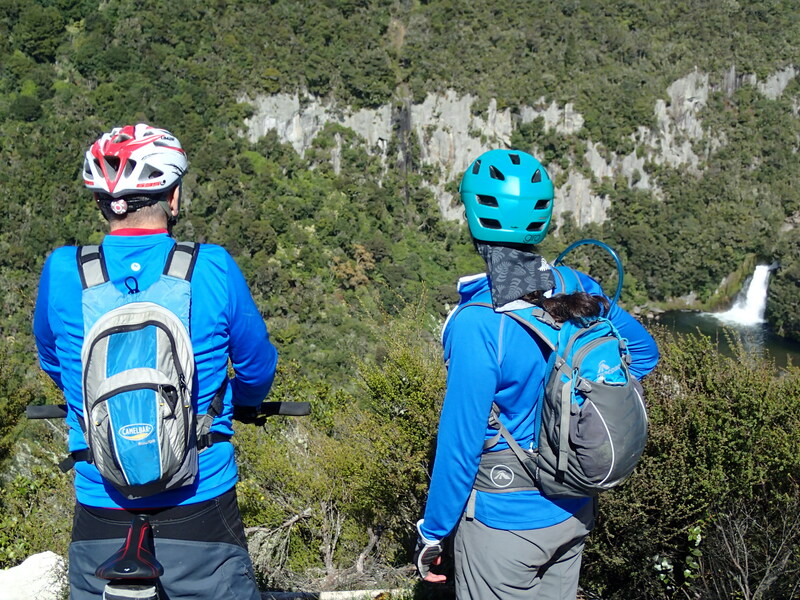 The sense of achievement and buzz gained from completing one of these trails can leave an indelible memory of your visit to this truly amazing area and will almost certainly have you planning your next mountain biking adventure to Taupo. Tongariro - A Uniquely New Zealand Experience. It’s been described as “the best one-day walk in the world” and yet the Tongariro Alpine Crossing is only one of many reasons to visit the Tongariro National Park. The national park was created by the gifting of land by Te Hue Hue Tukino, chief of Ngati Tuwharetoa Maori, in 1887. It was New Zealand’s first National Park and the fourth in the world and now has United Nations Dual World Heritage status, recognising both its outstanding natural and cultural importance. It has grown over the years and now occupies nearly 80,000ha. The park is dominated by the three volcanoes of Ruapehu, Tongariro and Ngauruhoe. It is visited by over one million people annually and is popular as a winter playground and in summer for hiking. Its impressive landscapes featured in The Lord of the Rings and Hobbit movies with Mt Ngauruhoe cameoing as Mt Doom. The volcanoes all erupt from time-to-time with the most recent being the Te Maari crater, near the Tongariro Alpine Crossing, in 2012. Mt Ruapehu, the highest of the volcanoes and the highest point in the North Island at 2797m, has eight named glaciers on its summit, the only permanent snow and ice in the North Island. There are numerous hikes in the park, from the multi-day Northern Circuit and Round the Mountain Walks, to the short walks of 1-4 hours duration to Tawhai Falls, Silica Rapids and Taranaki Falls. Nature abounds in all it beauty and you will see an amazing variety of landscape, plants and birds. To find out more about walks in the park check out Tongariro Hiking. 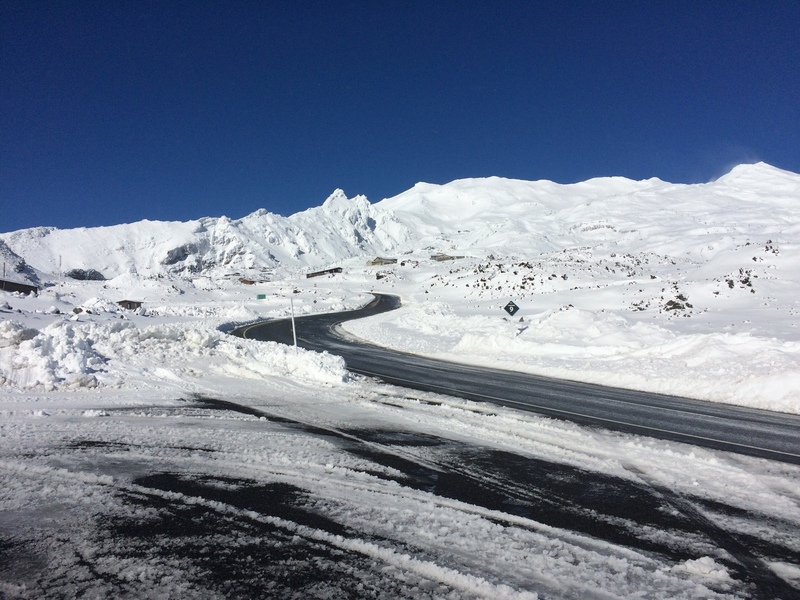 The three ski areas include the two commercial fields of Whakapapa, New Zealand’s largest ski field, and Turoa, and the smaller club field of Tukino. To find out more check out Ruapehu Alpine Lifts website or Tukino Skifield website. Tukino is known for its off-piste skiing and is nicknamed “the wild side”. Whether its winter sports or wine and food that is your interest, its well worth a visit at any time of the year to the Knoll Ridge Café. This architecturally awarded structure can easily be reached by averagely mobile people via chairlifts at any time of the year and located at 2200m high has stunning views of the Central North Island. Check about Tongariro National Park for more information. Tourism New Zealand chose Whakaipo Lodge to feature in their new promotional video of Taupo's Great Lake Trail. The video was shot over 3 days in March and the crew based themselves at Whakaipo Lodge during the shoot. The video is one of a series that Tourism New Zealand will use to promote Nga Haerenga, The New Zealand Cycle Trail, to international target markets. Tourism New Zealand worked with the local regional tourism organisation, Destination Great Lake Taupo and trail manager, Bike Taupo, to select Whakaipo Lodge for the production. It was specifically looking to promote boutique and luxury accommodation on the National Cycle Trail and located at Whakaipo Bay, Whakaipo Lodge was perfect as a base for the shoot. The lodge's sister company, Adventure Shuttles also featured in the shoot, providing transport for crew and bikes. You can check out the video here and we hope that you like it! 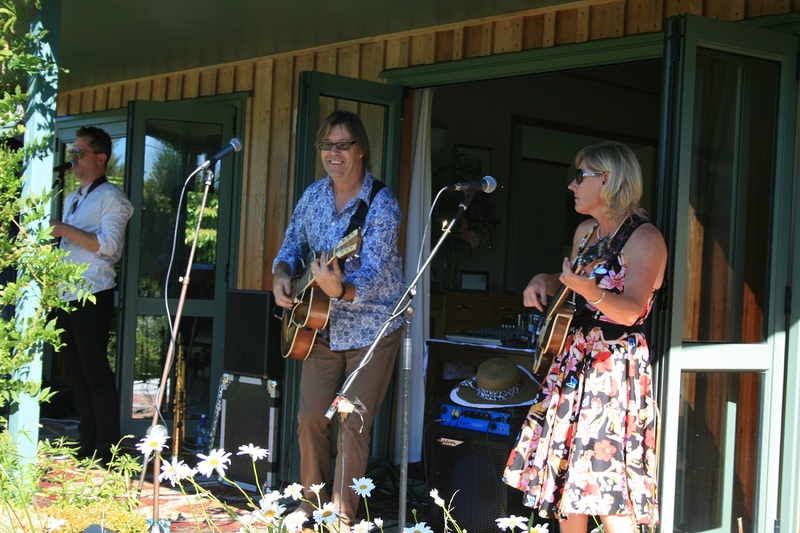 The forecast has improved and tickets are selling fast for the first Whakaipo Lodge Summer Concert this Saturday 28 February. Make sure you get your tickets now! Bike Taupo are providing a gourmet BBQ fundraiser and Jo from Volcanic Coffee will be there to provide refreshments. Parking is available on site and gates open at 3pm for the concert from 4pm - 7pm. See you there! Our latest newsletter (Summer) was launched today. Check it out here for lots of special deals, events & Taupo tips...Hit the SUBSCRIBE button and you qualify for extra special deals for our newsletter friends. Check out the latest edition of NZ Fitness Magazine (Oct/Nov 2014). Whakaipo Lodge & Adventure Shuttles feature in an article on the Great Lake Trail on page 50. Many of our guests have ridden the Great Lake Trail as its only a short bike ride from the Lodge. Our transport business, Adventure Shuttles, can get you to all the best trails in our beautiful district. Great news today (on the 1st year anniversary of our website/business launch). 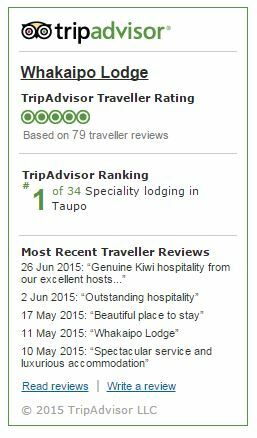 Whakaipo Lodge achieves a ranking of #2 of 37 Specialty Lodging in Taupo on Trip Advisor. So chuffed. Thanks to all our fabulous guests for taking the time to review us. We really appreciate it! Check out our reviews & ranking here. Whakaipo Lodge achieves top ranking on TripAdvisor! On 2 March we received news that we are ranked #1 of the Specialty Lodgings category in Taupo. This was obviously a source of pride and an endorsement from to all of the wonderful guests who took the time to write reviews for us. Thankyou so much for your support. In addition we were pleased to recieve TripAdvisor's Certificate of Excellence for 2015, recogintion of the work put in during the past 12 months. Things have also gone well on Booking.com with Whakaipo Lodge ranking at the top of Taupo accommodation with our review score currently at 9.8. A good crowd came from far and wide to see off the last day of summer the last Saturday in February in glorious weather at the Whakaipo Lodge Summer Concert held at the lodge in the Mapara Valley. The inaugural event featured blues influenced performer Andrew London and his band “Lucky Break”, including James Tait-Jamieson, Kirsten London and Neil Billington, belting out old favourites including “Emily Bay”, as well as new material from his 2014 album “Ladies a Plate”. Andrew is an old favourite in the area having performed for many years at various venues in and around Taupo. The event was also a fundraiser for Bike Taupo with over $500 raised at the gate for the charity and the Bike Taupo team selling gourmet burgers brought the total to over $800. Garth & Angie London, owners of Whakaipo Lodge were thrilled with the result. Look out for a similar event last weekend of February next year featuring Andrew back with a new lineup including Wayne Mason. The Andrew London Lucky Break Band featuring from left to right James Tait-Jamieson, Andrew and Kirsten London, with Neil Billington out of picture left. © Copyright 2019. Whakaipo Lodge.